Just finished my first rit dye and I'm super happy! Brand new yellow native 5 salt. Was going for black. I checked it after about 1 minute and it looked like this. Thought it looked very cool! Very good job! I think this color should be a standard offering. I vote for the Smokuchik. Middle finger flick, but usually with my hand pointed down and next to my leg to be discrete. I also use slow roll. Topic: How much are you willing to spend on a Chinese made knife? Re: How much are you willing to spend on a Chinese made knife? I focus on form, function, quality and service. So yes I'll spend whatever for Chinese made knives as long as my conditions are met. Heck I'll even buy German, Italian and French made knives. Welcome and congrats on your new acquisitions! I have several PM2 in various popular steels but the s110v really caught me by surprise, I am loving it. Hope it serves you well too (and your s30v is no slouch either). 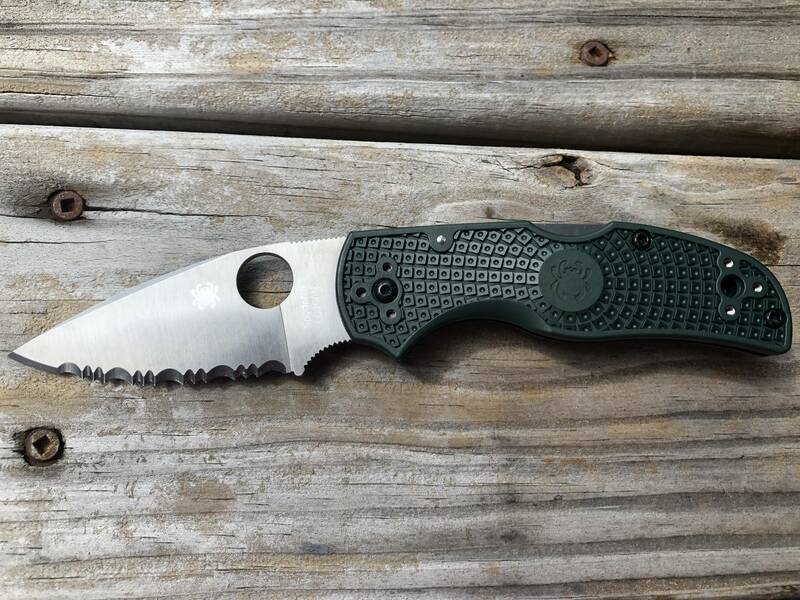 Constantly changing but the closest thing I have to a system might be a PM2 + SAK Huntsman. Lately it's more of the PM2 + Brad Zinker Dogtooth. As of four days ago the PM2 + Ikuchi. Don't have a CCW, but on my property I keep a Sig Sauer P228, P229, and P226. The P228 is a classic Austrian pure bred with proof stamps. All are tack drivers. Anyone else notice these sharpening marks in certain lights? Looks like something I would do when I sharpen Sorry, but my copy is nice and clean. I depend on long blade folders for cleaning and filleting small game fish (eg. crappie, trout, surf perch, pompano, herring) and for prepping bait. I've been asked by some people to illustrate the modifications I made to eliminate my Ikuchi bites. I'll show you what I did, but don't blame me if you screw something up. Thank you Zatx for the detailed explanation! I felt like I wasted 2 hours and 22 minutes of my life sitting thru that horrible acting and cartoon quality CGI.